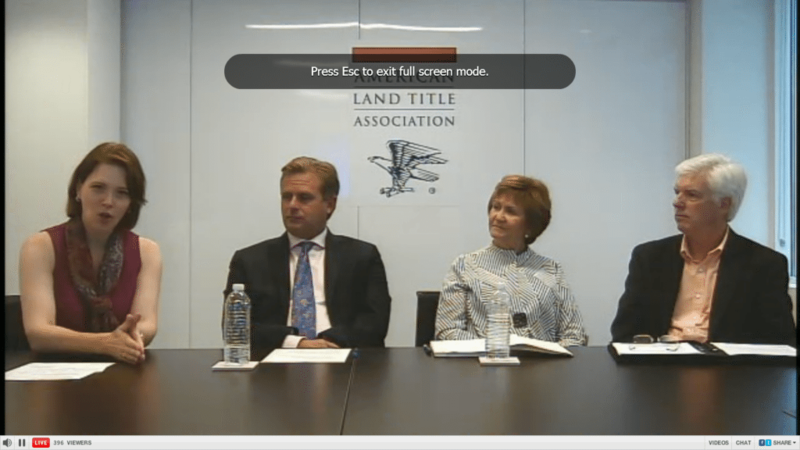 The American Land Title Association (ALTA) hosted a Facebook “town hall” to discuss what real estate industry participants should do to prepare for the new TRID regulations. A panel of ALTA leaders offered advice on what TRID readiness looks like and advised industry participants about what they should be doing to prepare. If agents are connecting with buyers who intend to purchase a home this fall, they should be educating buyers about the changes to the closing process. While the Consumer Financial Protection Bureau (CFPB) may have thrown the real estate industry a bone by extending the effective date of the TILA-RESPA Integrated Disclosures (TRID) rule to Oct. 3, the clock is ticking on the time everyone has left to prepare to comply with the sweeping mortgage regulation and related changes to real estate closings. And with real estate agents and brokers often at the center of those closings, it’s imperative for them to be talking to their lender and title insurance partners to set expectations for how closings will be conducted and consider how they may have to adapt how they currently do business, according to the American Land Title Association. With 66 days left before TRID takes effect, the national association for title insurance professionals hosted a “town hall” on Facebook to discuss what real estate industry participants should be doing to prepare for the new regulation. More than 500 professionals from the title insurance, mortgage lending, real estate, escrow and compliance industries attended the free hourlong Q&A. A panel of ALTA leaders offered advice on what TRID readiness looks like, advised industry participants about what they should be doing to prepare to use the new Closing Disclosure and Loan Estimate forms, and answered questions about how to handle certain real-life closing situations in a compliant manner. The panel comprised Diane Evans, ALTA president and vice president of Land Title Guarantee Co. in Denver; Dan Mennenoh, an ALTA board member and president of H.B. Wilkinson Title Co. in Galena, Illinois; and Bill Burding, another ALTA board member and executive vice president/general counsel of Orange Coast Title Co. in Santa Ana, California. A screencap from the ALTA Facebook chat. Since the TRID rule was finalized in November 2013, ALTA has taken the lead in educating all real estate industry professionals about the changes to the closing process. The association has encouraged real estate agents and brokers to communicate with lenders and title professionals much earlier in the process, the panel said. Realtors may also want to do walk-throughs with their customers earlier than they currently do, or even consider doing two walk-throughs, the panel said. Realtors might want to consider two walk-throughs, post-TRID. “The walk-through is going to have a measurable effect on what the final Closing Disclosure will look like,” Burding said. If agents are connecting with buyers who intend to purchase a home this fall, they should be educating buyers about the changes to the closing process as well, the panel advised. All of the panelists stressed the importance of all closing table parties communicating with their partners, especially lenders, who are charged with making sure everyone complies with TRID. Diane Evans: The lenders are driving the TRID bus. ALTA will make a recording of the town hall available on its Facebook page on July 31. The association will also answer some questions that it wasn’t able to get to during the town hall on its blog. Homebuyers crave title insurance information early in purchasing process -- but who will provide it?